Percentages of a particular order of magnitude are sometimes referred to by the number of nines or “class of nines” in the digits. For example, electricity that is delivered without interruptions (blackouts, brownouts or surges) 99.999% of the time would have 5 nines reliability, or class five. In particular, the term is used in connection with mainframes or enterprise computing, often as part of a service-level agreement. Similarly, percentages ending in a 5 have conventional names, traditionally the number of nines, then “five”, so 99.95% is “three nines five”, abbreviated 3N5. This is casually referred to as “three and a half nines”, but this is incorrect: a 5 is only a factor of 2, while a 9 is a factor of 10, so a 5 is 0.3 nines: 99.95% availability is 3.3 nines, not 3.5 nines. More simply, going from 99.9% availability to 99.95% availability is a factor of 2 (0.1% to 0.05% unavailability), but going from 99.95% to 99.99% availability is a factor of 5 (0.05% to 0.01% unavailability), over twice as much. In general, the number of nines is not often used by a network engineer when modeling and measuring availability because it is hard to apply in formula. 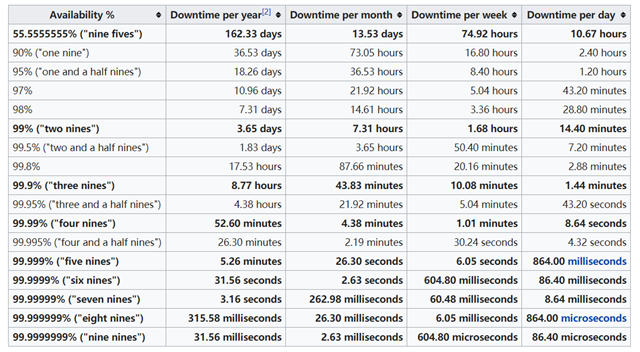 More often, the unavailability expressed as a probability (like 0.00001), or a downtime per year is quoted. Availability specified as a number of nines is often seen in marketing documents. The use of the “nines” has been called into question, since it does not appropriately reflect that the impact of unavailability varies with its time of occurrence. 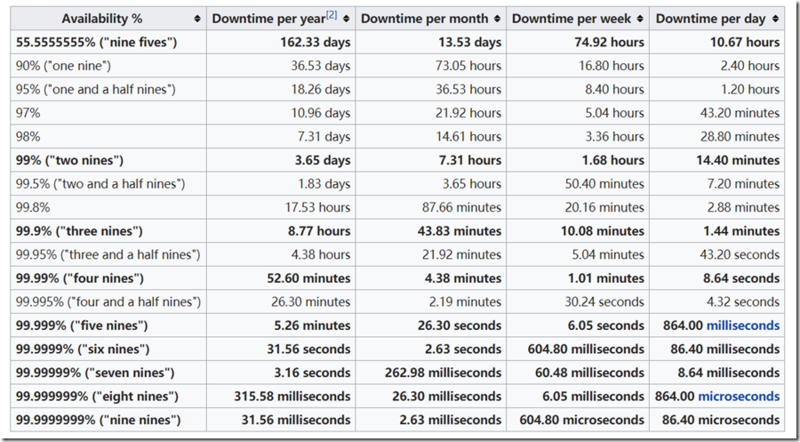 For large amounts of 9s, the “unavailability” index (measure of downtime rather than uptime) is easier to handle. For example, this is why an “unavailability” rather than availability metric is used in hard disk or data link bit error rates.